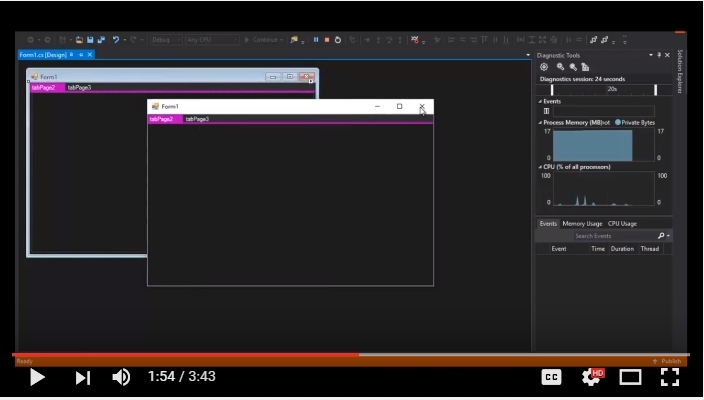 Visual Studio IDE has a really awesome theme that everyone likes. One of its best views is its customized and well-maintained TabControl, and that's why I made this usercontrol that looks like the TabControl used in Visual Studio. I (on an average) spend more than 10 hours using Visual Studio daily so I fell in love with its theme and wondered why don't I release a similar TabControl. 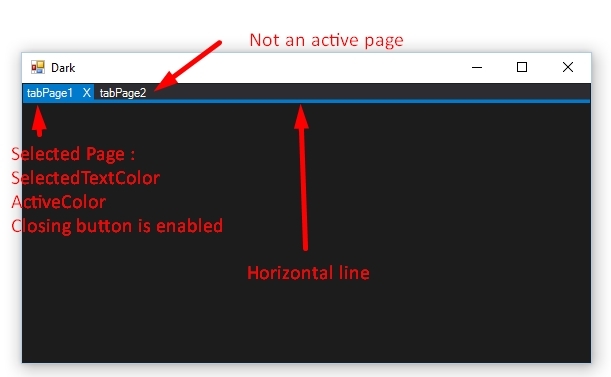 ClosingButtonColor: The color of the closing button "X"
Using the code is the same for everyone who worked using the normal TabControl before, for more details about the standard TabControl, I suggest you take a look at TabControl MSDN. One of the main tasks of this TabControl is to imitate the theme of Visual Studio IDE. By default, the control's theme is set to Dark-Theme which is a combination of black, gray, blue and white. 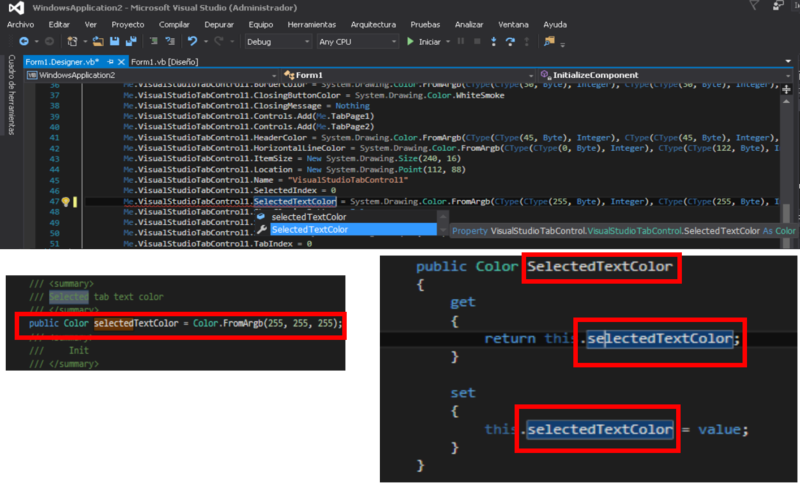 In the samples Form, I did add three themes which are: Dark, Light and blue (they are also the standard themes of Visual Studio IDE). To create a well-customized theme as the light theme, you have to let go of the mouse and use your hands a bit. I preferred writing bare code, but you can accomplish the same task using the properties window as well. That's all of it, folks ♥ ! Honestly, when I wrote the code, I used Visual Studio by then so I was looking at its TabControl and tried my best to copy it. haha :D .
• 6/14/2016 : Added a demonstration video. • 8/23/2016 : Fixed some comments. Great work, works like a charm, also in the designer. Had to do a little rework to get the tabs on the bottom but that was quite easy. Error when closing multiple tabs. Scenario, I programatically added the tabs then closed them one by one. System.ArgumentOutOfRangeException: Index 3 is out of range. Nice work! I wrote an improved one (source available). I took some inspiration from this and decided to re-write it. I've improved it fairly heavily to function and to look more like the actual Visual Studio TabControl, including the fonts used. An error simply occurs when trying to run! Then check the source code, apparently duplicate the name SelectedTextColor and selectedTextColor, why? The problem occurs because VB is not a case-sensitive programming language. Change the name. I looks very pretty and i like that it's winforms. Sadly, the design time functions don't work well. I can't switch between tabs. Only the first click after opening the winforms editor works and i can't move any controls placed in the tabs. Wow, this is a great custom tab control with nice theming support. I have a problem with right to left layout mode when the right to left property is set to yes. Titles of the tabs don't show the text correctly. Can you tell me how can I fix this? This issue is caused by my drawing algorithms. If the memory serves me well, you must change the drawing coordinates (x,y) of the drawn texts. How can add Multiline Support? Also.. i have added "ClosingColorBrush.Dispose()" at the end of the end of the For Each in the "OnPaint" event, as @Daniel Leykauf said. In your paint method you should always dispose each used brush. Furthermore are there unexpected header widths due to the font scaling. To get this fixed please read the first answer: UserPaint TabControl does not scale when changing the font.[^]. I would also prefer using of TextRenderer instead of DrawString. Nice suggestion, I'll check it. You did all this for WinForms (end of life) instead of WPF? WPF is about 10 years mature. No need to wait to come to the USA or go to a physical school. There are countless on-line resources. Just google "WPF Tutorial" or "MVVM Tutorial". Another implementation of the XAML markup language with the MVVM design pattern is Xamarin. The advantage of Xamarin is that you can use one code-base to create cross-platform applications for WindowsUWP/WinPhone/iOS/Android. I've been working on an enterprise-grade project with it for about 9 months and have to say I am *damned* impressed with it. It is now included free with all versions of Visual Studio including the Community Edition. They have their own on-line university, very helpful forum, dedicated area on Stackoverflow, and countless tutorials on their site as well as many 3rd party supporters. could you please make a vs-like-tab control in VC++? Is it possible to assign an icon to the tab? Is it possible to expose some event handlers, for instance, tab activated, tab deactivated, tab closing (cancellable), tab closed, tab created, etc.? Re: Great! I like it! There is no built-in method to add an icon to the tabs of the VisualStudioTabControl, to do such a thing you have to draw your image on your own, sorry for that I did not think of it, I will update it. Yes ! but you have to write some loops to determine if the current tab is the activated one or not(just in case). It is a great one. And it supports various skins, icons and events.